And just like that, we’ve arrived at Cyber Monday. I hope that you had a fabulous Thanksgiving weekend, that you got your fill of turkey and pumpkin pie, and that you made the best of some Black Friday deals. As much as I love this quick transition into the holidays, it always catches me off guard. I know that many people begin decking the halls well before Turkey Day, but I prefer to savor Thanksgiving before moving to the next holiday. The one drawback to this approach is that I’m never quite ready for the onslaught of Christmas festivities and busyness. Before I dive into the holiday chaos, I’m taking a moment today to reflect on the month of November. It’s been an interesting month. I’ll be discussing some of the more challenging aspects/emotions of the month this Wednesday when I share What I Learned in November. Today, I’m focusing on the good stuff—the books, shows, and highlights that were bright spots in my month. I’ve had great luck with library holds lately and was able to get my hands a number of (fairly) recent releases this month. I was incredibly impressed with both Truly Madly Guilty and Before the Fall, and can understand the hype surrounding these two novels. Both books were page turners with a surprising amount of depth. I also read Commonwealth, which I didn’t love as much as I expected to; it was my first Ann Patchet novel and I think my expectations might have been set too high. On the nonfiction front, I read two books that delved into a couple of my favorite subjects (books and personality type). 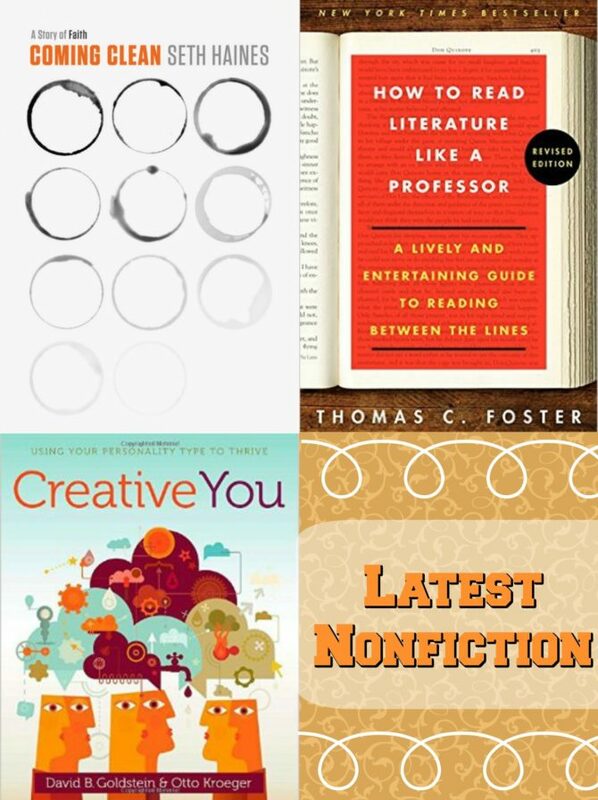 How to Read Literature Like a Professor provided me with some great tools for analyzing novels, and Creative You offered some unique strategies for channeling my inner creativity based on my Myers-Briggs type (INFJ!). I’m now reading Seth Haines’ poignant memoir Coming Clean, which gives a blow-by-blow account of his breakup with alcohol. 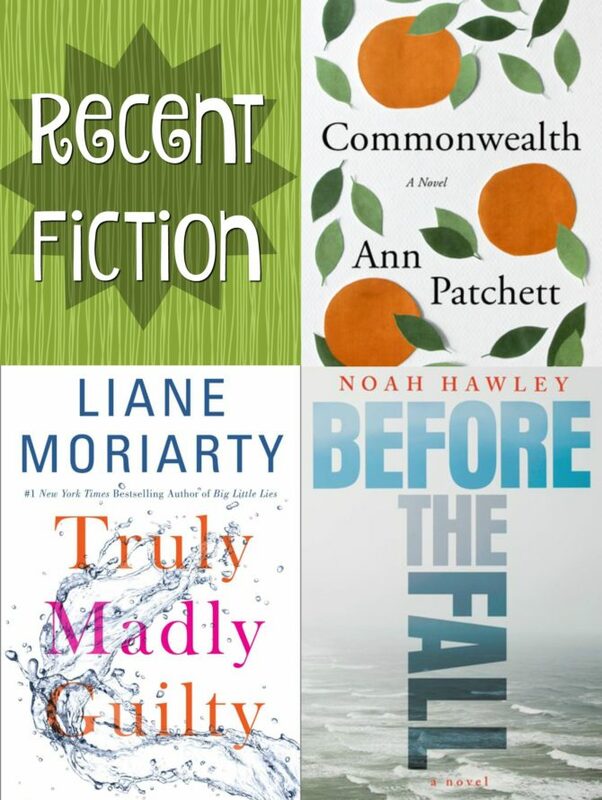 I’ll be sharing full reviews of these titles, as well as a few additional recent reads, in next month’s Quick Lit Reading Round-Up. I’m almost embarrassed to admit how many podcasts I listen to on a regular basis. I wish I had the space to elaborate on all of that fantastic content here, but I will limit myself to a few recent standouts. 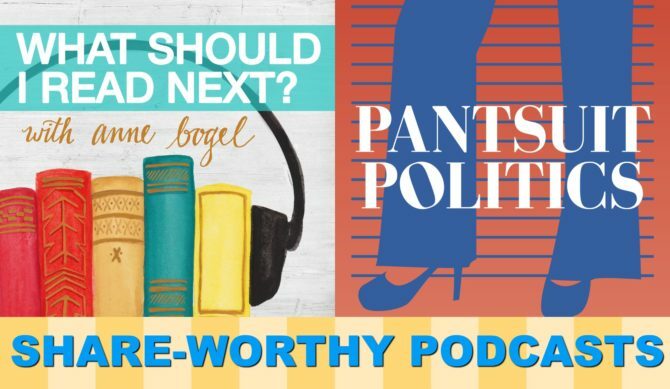 Pantsuit Politics: I generally stay away from political podcasts, but I discovered this one shorty before the election and have loved the balanced approach. The hosts are two women—one liberal and one conservative—and their show brings a refreshing amount of nuance and sanity to some hot-button political issues and current events. I appreciate the hosts’ civility and respect for opposing viewpoints, and their election coverage gave me insights from both political parties in a single news source. Their analysis of the election results has also been helpful as I try to understand all that is occurring in our nation. If you are interested in politics, but tired of sensationalized media and partisan name calling, Pantsuit Politics is definitely worth checking out. 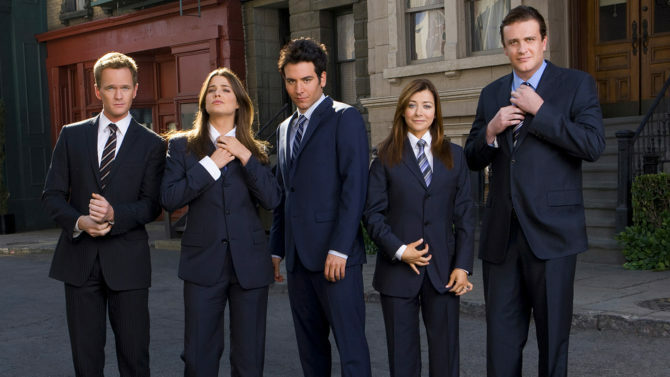 What Should I Read Next: I’ve spotlighted this show in the past and it continues to be a favorite. This month Anne hosted a special five-episode series dedicated to Children’s Literature. 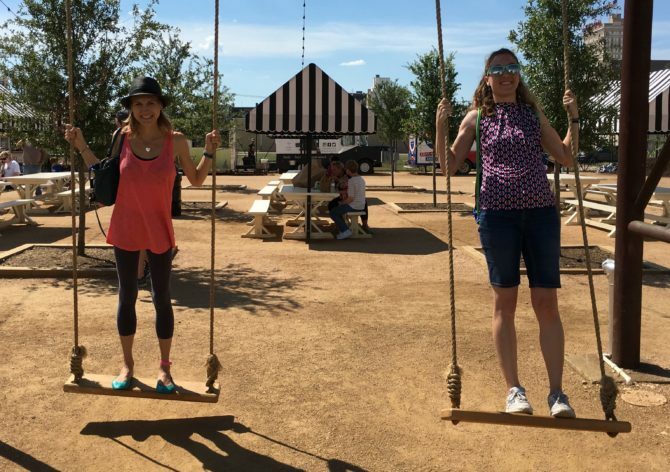 Included in Anne’s guests for the week were the hosts of a few other favorite podcasts, including Gretchen Rubin and Sarah Mackenzie (of Read Aloud Revival). I adore Kid Lit and thoroughly enjoyed the discussions of some childhood favorites, as well as some great recommendations for some books that immediately were added to my TBR. The theme was particularly fitting, as I am reading a childhood favorite for the twelfth and final category of my 2016 Reading Challenge. 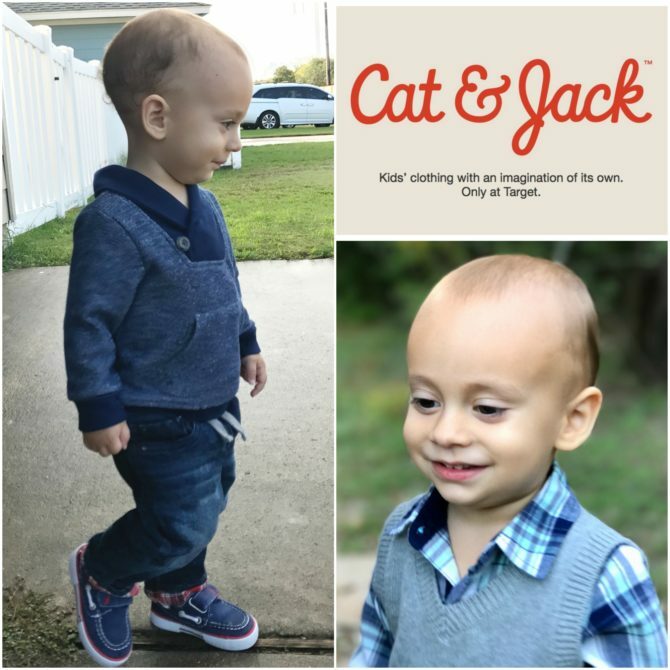 Cat & Jack: Call me shallow, but one of my great joys of parenting has been dressing my little one. I mean, it’s kind of like Barbies in real-life, right? I’m currently obsessed with the Cat & Jack line at Target. The clothes are incredibly cute and it’s Target, so the prices are great. If you have a young one and aren’t yet familiar with this new line, you simply must check it out. And a quick note on sizing: I’ve found these clothes run a little big compared to Carter’s and Old Navy (my other go-to sources for Charlie’s clothes). Daily Affirmations: My friend Cara and I started a fun new habit of texting each other every morning with positive affirmations. We’re working our way through the alphabet, taking a new letter each day and naming a positive trait about the other person. Words of Affirmation is a love language for both of us, so this has been a great way to help keep each others’ love tanks full. It’s also been a fun and creative way to stay in touch even though we live in different states. 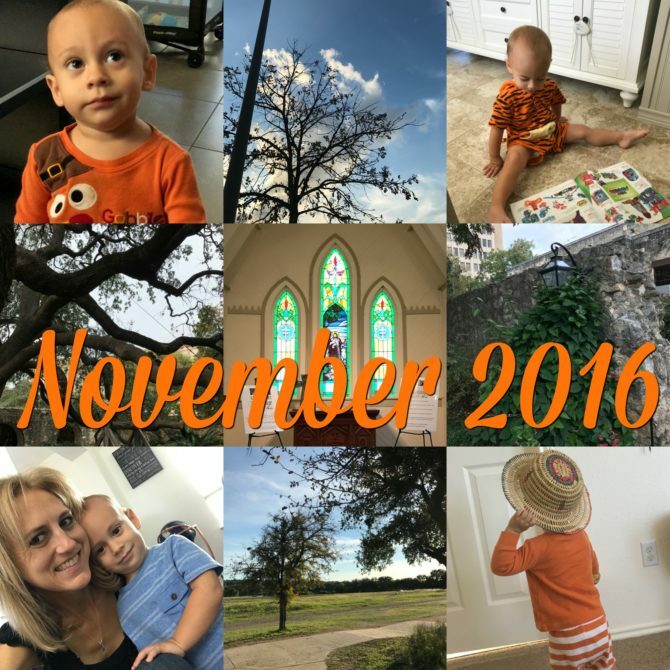 Obviously, the following Halloween activities took place in October, but since they occurred since my last Lately post, the “must-document-everything” voice in my head is insisting I include them here! 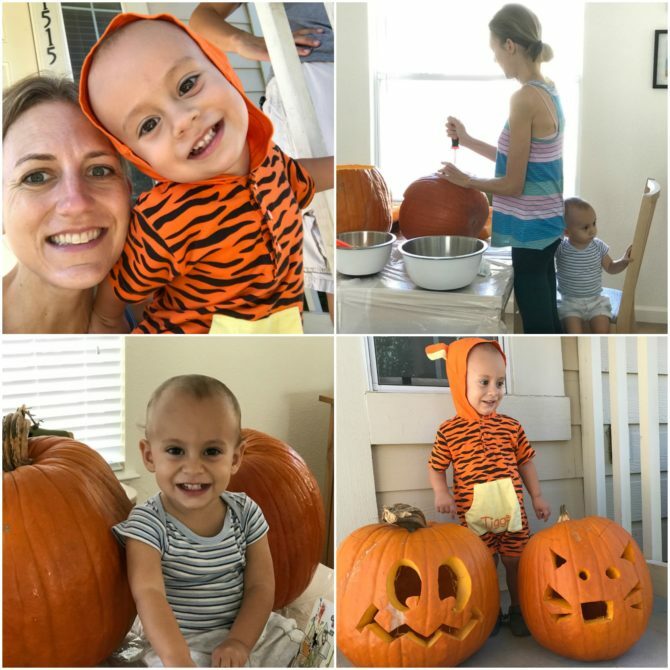 We kicked off Halloween weekend with my favorite Halloween tradition: pumpkin carving! I’m terrible at carving pumpkins, but it’s one time of year when I let go of my perfectionism and simply have fun. Charlie didn’t do much carving, but he enjoyed hanging out with Luke and me as we scooped and carved. Afterwards we dressed him up in his Tigger costume for some photos. I couldn’t believe how much he enjoyed dressing up, or how excited he was about our carved pumpkins. He kept trying to lift them and saying “heavy, heavy;” it was pretty hilarious and utterly adorable. On Halloween itself, we were all three sick with colds but were determined not to let it get us down. 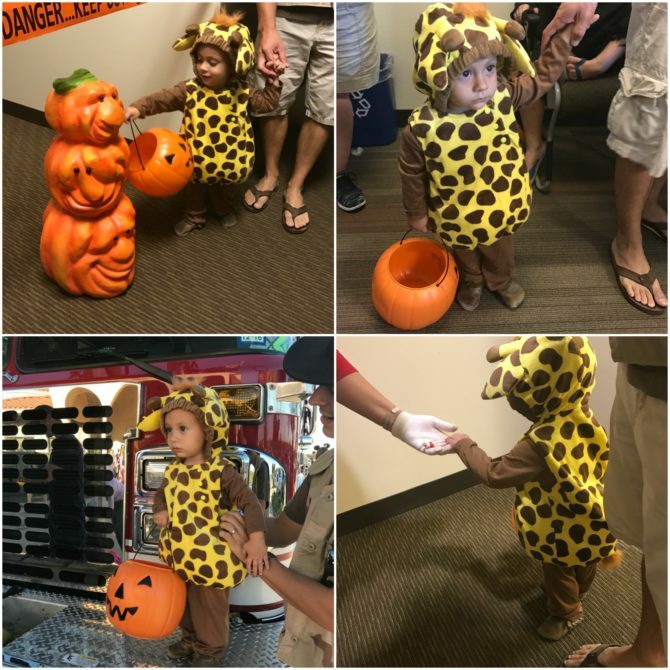 On Halloween afternoon we donned our giraffe-centric family costumes and headed to our City Hall for some Trick-or-Treating. It was a fun and festive event, and I was impressed with the amount of effort the employees put into dressing up and decorating their cubicles. Later that night we ventured down the street for some Trick-or-Treating in our neighborhood. I’m always amazed by the way neighborhoods come together for this tradition; we don’t know any of our neighbors, yet on Halloween night it’s perfectly acceptable to walk up to their doors and ask for candy! It’s pretty incredible (and perhaps a tradition we should do every day of the year to foster richer community!). Charlie caught on pretty quickly to the idea of going up to the doors and holding out his bucket for a piece of candy, and though we never got him to say “Trick-or-Treat,” he politely thanked each neighbor, including those who weren’t home! 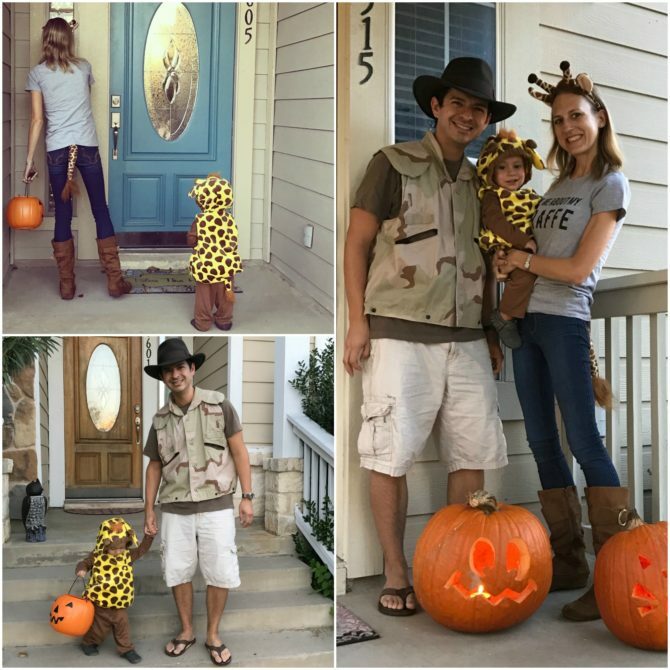 Overall, I think our whole family would agree that it was a successful Halloween! I participated in my first election since becoming a Texan. It was a tough election season (more on that this Wednesday! ), but I don’t take this civic responsibility lightly. Voting is a privilege and I feel honored to be able to participate in democracy in this way. Also. 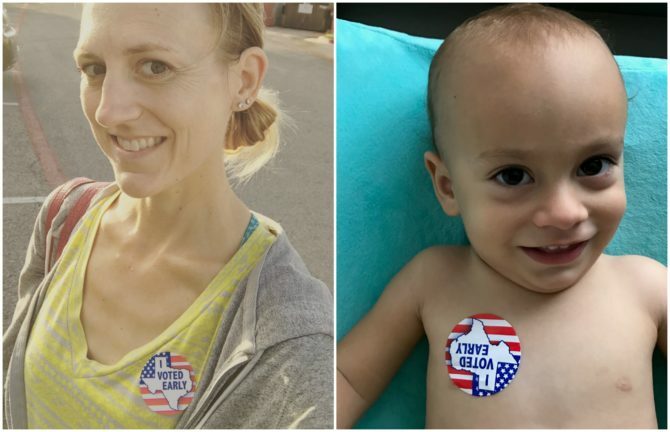 . . Texas has pretty good voter stickers! My good friend (and college room mate) Deanna and her daughter, Kate, came out from California to stay with us for a few days. It was the first time since college that Deanna and I have gotten to spend any extended time together, and it was such a treat to have them visit. Charlie has never had another kid stay with us in our house, and he was smitten. (Weeks later, he’s still wandering around the house asking for Kate!) The two were absolutely precious together! 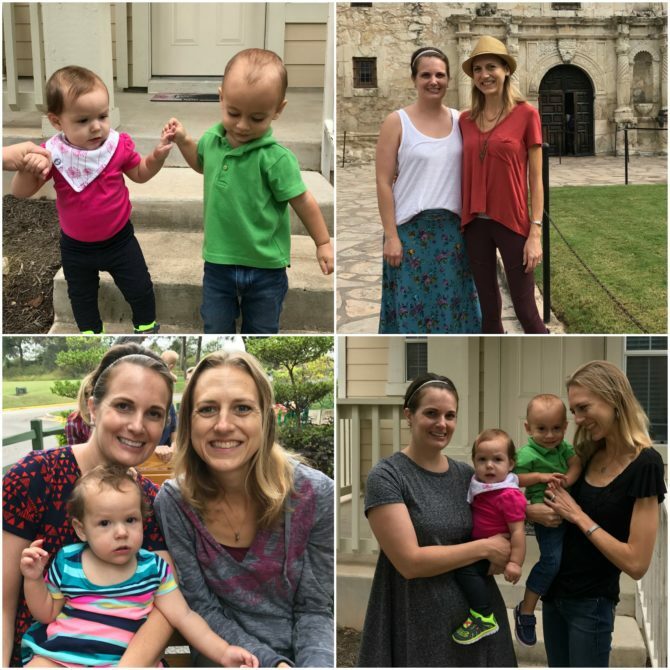 During their visit, we did some sightseeing downtown, rode the train at Zilker park, visited the charming Old Town District of nearby Georgetown, and took a day trip down to San Antonio for a stroll along the River Walk. Our weather wasn’t the greatest, but we managed to have a good time in spite of the rain. 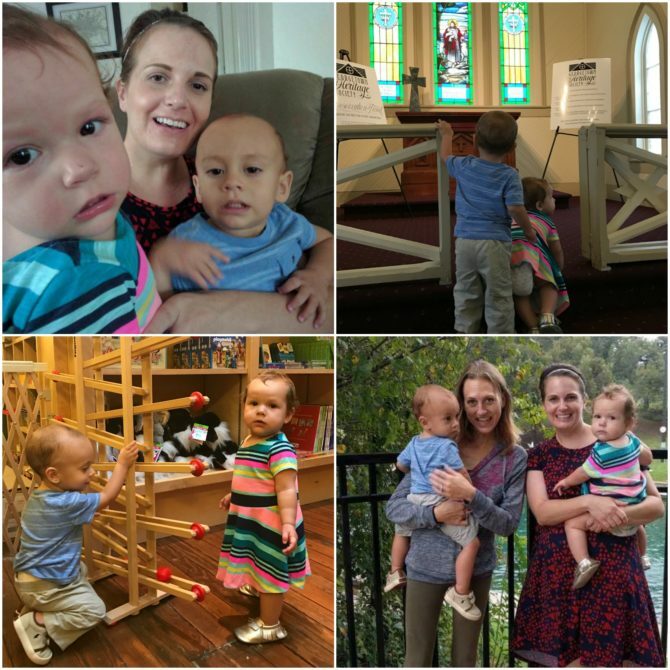 The activities were fun, but the company was even better, and our family felt truly blessed by their visit. My sister-in-law is getting married next year, which means that wedding plans are underway! 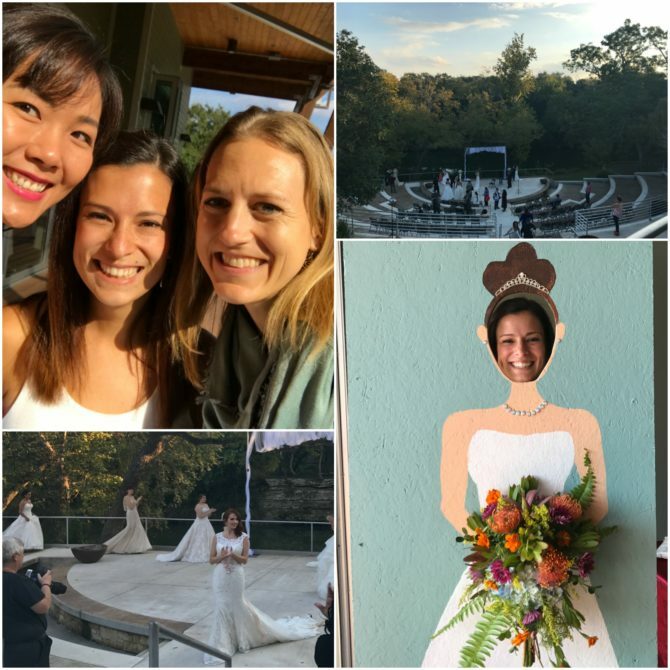 I had fun attending a local bridal show with Amanda and her Maid-of-Honor. It’s been eight years since I planned my own wedding, and the entire industry is so different now! I enjoyed the show and am looking forward to helping Amanda with her plans, but I have to admit that I’m finding it all a little overwhelming and am glad that I got married in a pre-Pinterest era! 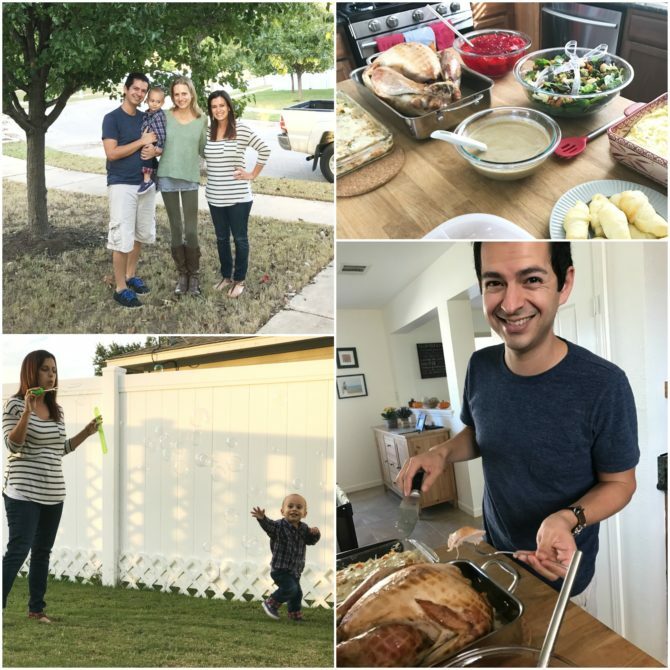 We celebrated our first Thanksgiving away from extended family. We definitely missed our loved ones but had a nice celebration. Amanda came over and we had a traditional Thanksgiving meal. We FaceTimed our families, played with Charlie, and capped the evening with a trip to Target for some Black Friday shopping. (I’ve never been shopping on Black Friday, and now that I’ve officially checked that experience off my list, I don’t feel the need to do it again, but I’m still glad we went.) As planned, I started the tradition of a Thanksgiving journal: I bought a simple notebook, and in it we each wrote a paragraph listing things we are thankful for. I’m looking forward to continuing this tradition and reflecting back over God’s provision and blessings through the years. What a full month, with so much to be thankful for! Thank YOU for reading and for being an important part of my November and every month!